There is an awakening from Above and an awakening from below. Everyone can be awakened from below in any state. For example, on Friday afternoon I can be in a state of the Day of Atonement (Yom Kippur) and two hours later in Pesach (Passover), or just in an ordinary weekday. This is what we call the spiritual levels and here everything depends on a person. In addition, there are phenomena that are part of the general order when there is an illumination from Above that comes in order to arrange the worlds. This is an awakening from Above that influences everyone. The difference between the general and the particular form is in the intensity of the awakening. If a person operates on his own, he corrects himself and eventually reaches his individual end of correction, by leaving the general “stony heart” uncorrected. On the other hand, the general corrections are much wider and more intensive; it’s a totally different thing. This is also the difference between an individual and a group, since it’s in a group that we discover the upper force and all the individual levels are transcended in the relations with the friends. In the article “The Discernment of a Wife and Sons in the Torah,” in The Rungs of the Ladder, Rabash says: Good days implies the ascents of the worlds, as each one rises a level, and rises a bit above the state it is in. This means that everyone who is part of the worlds rises together with the worlds. However, whoever is not on the ladder of the spiritual levels climbs them, since they require self-annulment. If you can annul yourself, then everything that happens in the worlds will happen with you and by your self-annulment you are included in the spiritual processes. Rabash continues: And this is the time when everyone checks the cause for which he takes upon himself the yoke of Heaven. Why should I annul myself in order to ascend with the worlds? What will I gain from that? If I had already known the answer I may have not ascended. What do I actually get? Love of others? Concern for others? General connection? Do I really need all this? A person should check whether it’s worthwhile to pay for this by such great efforts and exertion, giving up all his previous life and annulling himself. Malchut annuls itself before Bina, which means that the desire to receive is annulled before the desire to bestow. This question is also relevant today, before Rosh Hashanah, (the New Year). Usually people wish one another a good year. So how do I imagine what a good year is? This is exactly what I have to check. A year is a change, the next level, an ascent. What changes would I want in the new year? A raise in my salary? Or something else? A person should check for what he should annul himself. Time after time we discover to what extent we can bear self-annulment in order to reach the level of others, and to serve others devotedly. Before you attribute nice words to the Creator and praise Him, you should relate to all of humanity. The basic condition is: from the love of the created beings to the love of the Creator. Otherwise nothing works; first you have to prepare the vessels, and your vessels are humanity. Then the Creator is revealed to you there, according to your equivalence to Him. When you treat people correctly, He reveals His attitude to you. This is where you will meet in mutual vessels. Question: Does this mean that I have to wish humanity a good year? Answer: Now you have desires, intentions, and different inclinations and you annul them in order to adhere to the Creator, Who is absolute love. You can’t be totally in bestowal if you don’t annul yourself in some sense. Baal HaSulam, Shamati, #168, “The Customs of Israel”: The customs of Israel are so important, that it is safe to say that they give more spirituality to a person than the Mitzvot themselves. This is so although breaking a custom does not yield punishment, and breaking a judgment does yield punishment. Still, concerning the benefit, meaning producing fear of heaven, the customs yield more spirituality, since the great ones who established the customs arranged it so that spirituality would shine through them. There is a great problem as for the corporeal actions that are aimed at love and connection; actions which Rabash describes in his articles about the society. We mustn’t think lightly of them and thus we perform everything relatively. So we study, work in the group, carry out the advice of the Kabbalists, and it doesn’t matter whether we understand them or not. They attached special help from Above to their advice—the Light that Reforms. So, even though our intention is egoistic (Lo Lishma – Not for Her Name) from Lo Lishma we arrive at the altruistic intention of Lishma (For Her Name). Everything that helps you reach correction in the meantime is used with the intention of in order to receive, which means with egoistic intentions, is called a “custom.” You operate in order to connect and even if you don’t want to connect, even if you are looking for self-benefit, the Light comes and brings you a different intention, which you couldn’t even have asked for. You didn’t even think about it, but it happens—you suddenly begin to appreciate the attributes of bestowal and love. In order to do that, we need group work: to annul yourself, to raise the friends in your eyes, to spur them and yourself. Yes, you want to gain something by these actions, after all, you benefit by such actions since this is the only way to draw the Light. It’s a simple law: The Light comes only to the desire that is similar to it in its properties. True, you haven’t reached an equivalence of form yet, but you have the corporeal body and this is what it was created for, so that with it you will support the friends and tell them how much you love them and how important the Creator is, and give them examples of bestowal and of self-annulment. With the help of our bodies we connect to one another. Although all our actions in the group are in order to receive, they are the type of actions Kabbalists have prepared especially in order to attain true connection. My intentions are the opposite, malicious, I intend to use the upper world and the Creator for my own benefit, but the actions I perform are right and thanks to them, thanks to the mechanism Kabbalists have created, I can correct myself. Otherwise, how could I exit the shattering? Here the “customs” are necessary, the right action that lead to the right intentions. Kabbalists have performed special corrections in order to insert the Light that Reforms into the customs after the “shattering.” The Light can’t pour into the “vessels” that are below, beyond the “shattering line,” within the desire to receive. Still it’s possible to raise the vessels that are beginning to wake up. Thus we begin to work. How Much Does My Correction Cost? The best states of all are when a person needs a connection with the Creator. A connection can only occur when he needs the help of the Creator. And he should want this help not for himself; otherwise, it would have been an egoistic desire. But precisely above his desire, the yearning to do good, he can build relations with others and begin to take care of them, help them to be corrected, act in their direction. Thus a person will change caring for himself to caring for others to such an extent that he will ask the Creator to help him realize this care, to correct his friends and thus bring pleasure to the Creator. This is the building of the whole system of relationship within a person in the direction of the other, in the direction of the Creator. It does not exist naturally, and it will never emerge in a person by itself. A person has to build it above the egoistic desire that is revealed before him. This work is called the work of Israel, of a person who strives straight to the Creator, who starts to work on the basis of the first desire revealed in him, and who gradually turns all his desires towards the Creator. This is the work of Moses who turns to the Pharaoh demanding he release Israel from slavery, and the work of the Pharaoh on the people of Israel and Moses so that they feel how they need the Creator’s help. A person should find out that the main work in his heart concerning the Creator and the Pharaoh is aimed to bring the people out of slavery, that is, to purify all the desires, the entire world. The entire world are parts of the human soul, and a person’s duty is to free this whole world from the power of the egoistic Pharaoh. Through studies, the group, and many clarifications, he needs to turn his personal, selfish desire to attain the spiritual work, to reveal the Creator to the correct desire to bestow. If he gets an awakening every time, this is the sign that the Creator wants him and his duty is to fulfill this desire! If a person does not use the received awakening once, twice, or the third time, then he is left alone for some time, perhaps until the end of this life or even for several life cycles, until finally, he is given a chance from Above to become awakened. That is why we must be very wary of losing even a moment, a desire, a gift from Above, because no one knows when it is manifested again. The problem is that 99% of the people who get an awakening from Above simply do not pay attention at it and do not realize it. They treat this unique chance presented from Above as something ordinary in this world that it will not disappear and can wait until tomorrow, a few hours or a few days, another time. They do not look at themselves from aside in order to relate to this awakening in a spiritual way and not in a material one, and do not begin to work on the entire common vessel, on connection with others, on dissemination of this knowledge, and correction of the world. That is, they do not start acting to reveal the Creator, the only thing that we lack in this world, the panacea for all our problems. Question: What is the essence of the phrase “the one who prays for his friends receives first”? It’s a very confusing statement for me because asking the Creator to change my desire is still a prayer for my own benefit, since I already know that I will be the one who receives before others. It’s something that really bothers me. Answer: It shows that you don’t pray for your friend yet. “The one praying for his neighbor receives first” implies that the one who prays doesn’t think of himself at all, nor does he concentrate on who receives first. Yes, he does receive before others, since the Light has to transcend through him to his friends. How else? He simply rises to a level at which he prays for his friend without any thought about himself. There is nothing about one’s “self,” nor does one pray to improve his personal matters. All one wishes is to fulfill his friend’s appeal. He doesn’t have a desire of his own of any kind whatsoever! In this case, one really receives before others because he conveys the Light to his friends. We have covered this material. Our souls are present in the worlds of Beria, Yetzira and Assiya. We have multiple questions and requests. If we raise them to Malchut of the world of Assiya, then Malchut raises them even higher, to Zeir Anpin of the world of Atzilut; the one who raises MAN brings up a request of his friends who are supposedly still staying “below.” Then, he becomes the first to receive the Light from Above. The Light goes through him first, and then it transcends through Malchut to other souls. Question: So, it means that in order to obtain such a desire I first have to appeal to the Creator and ask Him to give it to me, to make it completely free of egoism, without even a drop of selfishness, right? Answer: Certainly! In this case, it will be a prayer that precedes another prayer. Otherwise it’s just another egoistic loop, nothing more than that. Question: What does “Adam” mean? Is it a thought or a visual image? Answer: Adam stands for two parts, desires and thoughts, since we consist of both heart and mind. It’s important to understand that desires are primary to thoughts and that they direct our mind. Thoughts develop in us in accordance with the quality of our desires. There is a proverb, “The more one is beaten, the smarter one gets.” This is because our willingness to rid ourselves of affliction promotes our growth. We become more ingenious and smart when we seek how to escape suffering and be fulfilled with something we really want. Therefore, no matter how great or respected our mind is, it still is simply an attendant that serves our desires. Having agreed to that, we should instigate higher desires within us. Then, our mind will rise to reach them. Let’s say, in a group of ten, we rise to a degree at which all of us have the same desires that transcend our bodily material wishes. We should leave all sensible desires, as well as earthly matters, at home. As soon as the group enters a place—a studio, classroom, or so forth, that could be called a lab—that’s it! The door is shut. The external world ceases to exist. Only those who are in the room are important. It’s as if we were on board a spaceship that is flying to an unknown place for an indefinite time. We lose the sense of time; and earthly problems do not trouble us any longer. Nothing matters! Our goal is to ascertain a structure called Adam (man). What kind of desire shall we have? It should only be to merge with each other, to become one whole. Accordingly, we begin realizing that the structure we are trying to define is similar to nature, which, nowadays, manifests itself as an integral, unified, and complete organism. If we understand this fact, we’ll feel much better and more at ease. We will comprehend nature better and will be able to read it. Then, if we regard nature from the integral point of view that we should form between us, we’ll instinctively perceive and follow its laws. We will realize that it’s essential to re-organize our lives, even at the regular, material, and routine level. Let’s induce such desires within us. Let’s aspire to rise above ourselves, regardless of our earthly goals and hopes. We must uplift and enhance our integral “something” and bring it beyond all material issues. It’s our duty to completely support each other in this task. “The coincidence between financial and meteorological hurricanes may not be entirely fortuitous. The global economy, like the world’s atmosphere, is a finely balanced complex system. “In China, economic activity has failed to accelerate as expected, despite repeated attempts at monetary and fiscal stimulus. This could mean simply that the government and the central bank have not yet done enough. It is possible, however, that the Chinese economy has become too complex to be managed and fine-tuned as effectively as in the past. Or perhaps the disappointing results of Chinese stimulus thus far reflect a broader failure of monetary policy, which is becoming evident around the world. Recent disappointments in Britain support the latter interpretation. My Comment: A lack of understanding of the nature of the process is the cause of our state, and the problem will disappear only when we become aware of its cause and our actions are in accordance with the program of nature (See Baal HaSulam’s article “Peace in the World”). The Creator created a desire to receive that is in the world of Ein Sof (Infinity). It is the only creation, “something from nothing,” and it is adhered to the Creator. That’s the way it is from the Creator’s perspective. Then, by special actions, the Creator separated and distanced that creation from Him by force, and a partition was created between them that separated these two attributes of receiving and bestowal. Now, there is a gap of 125 degrees between them, and the created being is like an organ that has been cut off the body and has lost its feeling. We don’t feel the connection with the Creator since we are cut off from Him like an organ that is cut off from the body. If a person hadn’t received an awakening from Above, he would never think about it, but would live like all the other animals. A human being is the awakening to the upper that is evoked in us: a desire to become like the Creator, connected to Him. Without this awakening, we would remain on the still, vegetative, and animate levels of development. The level of “speaking” is determined by our attraction to the Creator. So, this level can be called human because Adam (man) means similar (Domeh) to the Creator. This awakening is called a point in the heart, and it allows us to be called Israel, a person who yearns Yashar El (straight to the Creator). Such a person has the task of returning to the Creator through his own efforts and various exercises called Torah and Mitzvot (the commandments). The Torah is the Light that Reforms that operates on the desire and turns it into in order to bestow. Such actions are called Mitzvot and are created by a special force called the Light that Reforms. 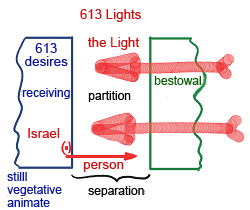 This Light is made of 620 Lights that operate on 613 desires, thus correcting them and annulling the partition between the created being and the Creator. The force of separation becomes the force of adhesion. It amplifies the initial adhesion by 620 times, according to our division in the world of Ein Sof. If a person’s point in the heart was not evoked, he would never wake up and would remain on the levels of the still, vegetative, and animate nature. Thus, we see how important it is for those in whom the “point in the heart” was evoked to fulfill this yearning in every possible way and not to hide from it behind any other dealings. We must help all those who were awakened because they are really the special, chosen ones in this world. It is possible to annul the partition that separates humanity from the Creator only with their help. All the others will join them and help them to the extent that their readiness to do so is revealed in them. This is also a holy work. To the extent that we annul the partition, its force will change from the force of resistance to a force that assists connection. Just as in an electronic schema where every component has a resistance, and if this schema were to be connected to a power generator, the particle would begin to operate according to its resistance, which means that it would become a beneficial part. The more it resists, it performs greater work and brings more benefit. The same thing happens with the evil inclination. It is thanks to it that we ascend the 125 degrees when it turns into the good inclination. We connect 620 times more strongly than before. First, in the world of Ein Sof (Infinity) we had no idea whether we were separated or connected. We existed like an embryo in its mother’s womb that was created that way, and knows nothing else. We must regard the ego as a real angel, that is, as a special force that raises us to the human level. This whole separation was needed only so that we would discover the depth of connection, understand it, and feel it to its full depth. We will not exist in it passively, like an embryo in his mother’s womb that knows nothing and understands nothing. Instead, we will cooperate in it like the “two great Lights,” like equals, like two lovers, mutually connected into one whole. It is only then that we can really make each other happy. Question: If you had participated in the discussion in a circle, how would you have reasoned to bring integrality into this discussion? Answer: I would have allowed people to express the most opposite, differing points of view, and then I would ask, “In order to come to an agreement, on the basis of the conditions that we have, what conditions do we use in order to choose, from all your proposals, the most appropriate, beautiful, and necessary one that has the right to exist?” A criterion should be for this. It’s not what we are doing, but do we see in this more communication, warmth, security, adhesion, and higher attainment, that is, advancement, progress in integrality? If nature sets us up for this, do we go in unison with it? If so, then, yes. If not, then no. We are in the process of evolution. Where does it go? We need to anticipate and predict its next step, and in line with how we foresee this step, we need to bring our actions closer to it, and we will succeed in life. It will be easy, free, and simple for us. What is nature’s next step? It is necessary to bring them to these thoughts, and then, with the help of higher integral sensitivity, they will determine how to do better.